Question: Is National City in Kansas? The episode’s called “Not Kansas” and I know Kansas plays a big role in the Superman mythos (Smallville, where Clark grew up, has usually been placed in Kansas, and occasionally Metropolis is placed there, too) but I have no idea where National City is supposed to be. Like, I get that the title is a play on the Wizard of Oz “not in Kansas anymore” line because Kara zips on back to Argo to hang out with her fellow living Kryptonians, but I was just wondering if they were trying to give it a double meaning and set National City in Kansas. Anyway, this episode’s a mess. The fight we ended on last week is over in less than a minute: Lena injects Reign with some black goo she developed from that black rock from Argo and Reign splits off from Sam in a shower of sparkles. With the major threat of the season out of the way, Kara thinks it’s time for her to get back to Argo and visit her people for an indefinite amount of time. And speaking of Argo, a quick kudos (they’ll be sparing in this review, so enjoy it) to the show for not bringing Clark/Superman into this Argo find and making it a dual Kryptonian reunion. I mean, yes, Clark is Kryptonian, but it would make sense that Kara would be far more eager to revisit a piece of her planet than Clark would, since Clark has no memories of Krypton and Kara spent twelve to thirteen years of her life there. Discovering Argo is definitely more for Kara than it is for Clark, though I suppose an offhand comment from Kara about telling Clark and him brushing the knowledge away wouldn’t have gone amiss. Anyway, from the beginning, “Not Kansas” gives me season finale vibes, as if the universe were trying desperately to end this season as soon as possible and failing. It would have been a pretty good finale, too, with a little restructuring. Imagine: the penultimate episode is all about Kara getting the rock to defeat Reign, and she does, but Reign breaks free at the end. The finale starts, with Reign on a rampage and Lena spending the first two acts desperately trying to create the formula that would separate Reign from Sam. Rising action! And then the climax would be Reign going after Ruby again, but Sam fighting her from the inside long enough for Lena to create the cure, Kara to dose her, and allow everything to end happily. Having discovered Argo, the final scene would be Kara deciding to spend at least a few months on a floating piece of Krypton, destined to return to Earth for next season. But, no. Instead, we get another one of season three’s “two steps forward, one step back” episodes, in which everyone thinks Reign is defeated because of the black rock, but she’s secretly not defeated! Because one of the Worldkiller priestesses was the person who gave Kara the black rock! So Reign will return and we’ll be right back where we were last episode and why does this show love wasting our time like this? This isn’t narrative pacing, it’s a narrative drunken stumble. The problem is that the Argo concept is really interesting, but not dramatically interesting. It’s interesting to think about a piece of Krypton getting found and Kara reuniting with her people, but there’s nothing intrinsically compelling about it from a long-term narrative perspective. It’s great for Kara’s emotional turmoil and her struggle with identity, and maybe it has potential for a very good episode or two of Kara reconnecting with her Kryptonian roots and discovering that her place really is on Earth, but we are way too close to the end of the season for something like that. And “Not Kansas” squanders its potential anyway, so this episode is something of a double failure on the Argo front. Most of Kara’s time on Argo isn’t spent in deep contemplation of her place in the universe, her identity as either a Kryptonian or a citizen of Earth, or whether she feels welcome or alienated by being not-quite home. It’s spent with Kara in a state of near-insane paranoia over some lady in the marketplace hanging out around where a crane fell over, and then getting proven right when the lady reveals herself — and one of the Kryptonian leaders — to be a follower of the Worldkillers. Kara and Mon-El realize that the black rock they’d used to cure Sam of her Reign issues might not be as functional as they’d originally assumed, but it’s too late. Worldkiller followers have taken their ship back to Earth, leaving them stranded on Argo and unable to send word of the impending danger to the folks back home. Does anyone else remember when Arrow did that clunky, tone deaf episode inspired by the gun debate? Well, Supergirl is here with Gun Debate Episode Part II: The Quest for More Cringe, and while the environment for hot button political topics on Supergirl is more welcoming than it is on Arrow, this still falls flat. I’m starting to think that maybe — just maybe! — corny comic book shows shouldn’t try to chime in on this particular topic, because the result is uncomfortable oversimplification and a storyline made entirely of platitude. I don’t even know how you can generate an entire storyline out of platitude, but Supergirl managed it! A summary: Guardian interrupts a shoot-out between a masked man and some everyday cops, saves the cop, and uses his shield to, well, shield himself from gunfire. The gun that fires at him is a super special, ultra-powerful type specifically made for the DEO. When J’onn confronts the gun manufacturer about this situation, the manufacturer admits that they do make a civilian version of the gun and refuses to take it off the market. J’onn decides to take the DEO’s business elsewhere, but I’m pretty sure that gun manufacturer dude doesn’t care because he just admitted that the DEO isn’t their only buyer. After looking into civilians who have bought the DEO-style gun, Winn finds one in particular with a manifesto and James confirms it’s probably that guy. Said guy wants to shoot up his former employers because... “former” employers, I suppose. 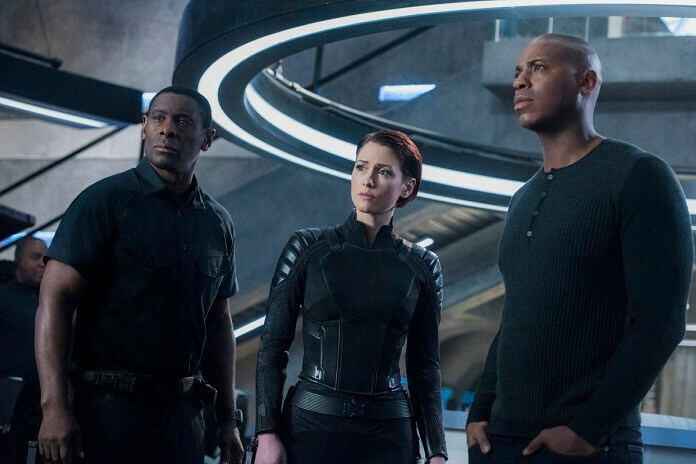 DEO agents clear the law firm where the guy used to work, J’onn talks him out of committing mass murder, and he’ll probably just go to jail for shooting at a cop. And attempted murder, since he also shot at James/Guardian and wanted to kill a bunch of his former co-workers. In the end, J’onn announces that the DEO will no longer be using lethal weaponry. Again, I have to point out that DEO agents were not the only ones using highly lethal weaponry, and that gun manufacturing company made no promises to stop selling their wares to civilians, so... I guess it’s noble of J’onn to have the DEO lead by example, but I’m not sure how this will work out. My biggest problem with this story, other than the fact that the DCTV shows keeps trying and failing to handle it in any meaningful or thoughtful way, is that it’s probably the most filler-y filler they’ve thrown at us all season — and they tried to disguise it as a Very Special Episode™! The absolute gall, Supergirl. It sure is convenient that the fake black rock worked just well enough to give Kara a false sense of security and make Sam appear normal just long enough to regain her freedom and custody of Ruby. I sure hope Alex’s new, cool gun has non-lethal settings, because she really liked that gun. Speaking of Alex: She starts looking at adoption websites at the end of this episode.